Immigrants And Tourists Need BeepTool. How Many, Exactly? Billions. If you’re going on vacation out of the country for a week without your boyfriend or girlfriend, how do you keep in touch? Talk and text apps, of course. Same if you’re moving away from home to take a new job. A chat app may be the only way to stay connected with mum back home. The problem is that international prepaid calling can be extremely unaffordable. Fortunately there’s BeepTool, which offers calls to some countries for less than a penny per minute, significantly lower than Viber or Skype. But how often do people really travel or move abroad? Well, it turns out it’s more often than you might think. According to a new dataset presented by IPSMARX, the number of travelers and expats is in the billions. More than 3 percent of the world’s population isn’t living in its home country. And by 2030, 1.8 billion people will have traveled internationally. Many of them will choose BeepTool for their communication needs by downloading our free app from Google Play, the Apple Store or right here on our website. Are chat apps like BeepTool replacing Twitter and Facebook? BeepTool rates: seriously inexpensive. Compare to Skype, Viber, and WhatsApp! BeepTool rates: seriously inexpensive. 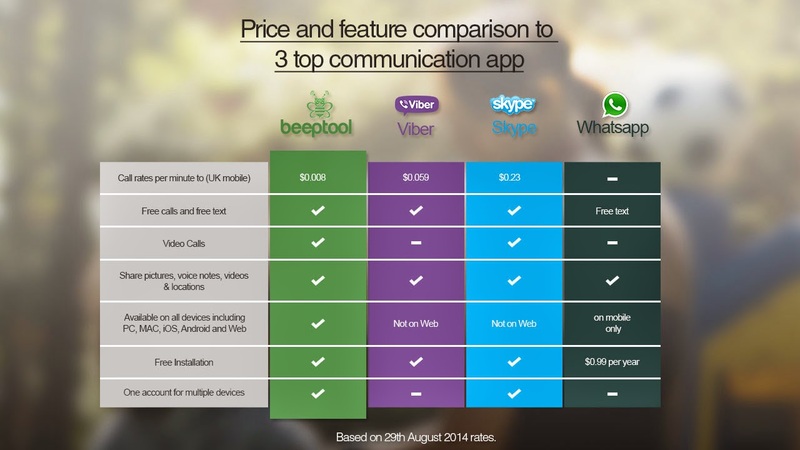 See our prices compared to Skype, Viber, and WhatsApp! Technology is getting better. Travel is getting cheaper. More of the people we love are living thousands of kilometers away. And for the very same reasons the world is more accessible, it’s also getting smaller. So what’s holding us back? What’s keeping us from truly effortless global communication? Well, a lot of things, but primarily it’s the mobile service providers. With outrageous international calling rates, it’s never convenient to call mum in Nigeria if you’re in the UK. In fact, it’s always an event, and an expensive one at that. At BeepTool, we’re working to change things. Although we’ve only launched a month ago, well over many thousands of people have seen the incredible value we offer, and more users are joining every day. Not only does BeepTool offer all the perks and freebies of the well-known talk-and-text apps, like Skype and Viber — but BeepTool rates are better when it comes to calling from our app to mobile phones and landlines anywhere in the world. We call it BeepTool Out. And it’s extremely easy. All you have to do is download the BeepTool app (it’s free! ), sign up with your phone number, connect to a source of internet, and place your call. It’s seriously that simple. And your account comes pre-loaded with $0.5 credit. And that $0.5? With us, it gets you a long way — much farther than with Skype, Viber, and WhatsApp. Just look at the rate comparison below. Download BeepTool today from Google Play, the Apple Store or right here on our website. DUBAI — As more developers try to stake claims on Africa’s growing appetite for free communication apps, BeepTool (www.beeptool.com) is creating a niche within a niche. CEO and President John Enoh, a UK-educated programmer from rural Nigeria, sees his company as a vehicle to broader social goals, including economic development and greater access to information on the continent. Enoh, 34, grew up far from any town. Even there in the Nigerian bush, mobile phones are commonplace now, but service is too expensive for a region where farming is the predominant industry. In 2012, he began developing BeepTool as a means of disrupting the service providers’ dominance. The app launched last month, and already it has over 6,000 users around the world (and counting). BeepTool-to-BeepTool video, calls and texts are free, and the rates for calls from BeepTool to mobile phones and landlines are significantly less expensive than Viber and Skype. Enoh has been building his company (with his own money) from Dubai, where he works full time for Ericsson. About BeepTool BeepTool is a free communication app that enables video conferencing, talk, text and file sharing on an array of devices. Its presence is growing fast in Africa and around the world. With BeepTool, users get free calls and text messages to anyone, anytime, anywhere in the world via WiFi or 3G/4G/LTE — without draining minutes from service providers. Available on iOS, Android, Mac, PC and HTML5.